So you have more than one kid, or you’re about to have more than one kid (good luck! ), and you need to haul them all. 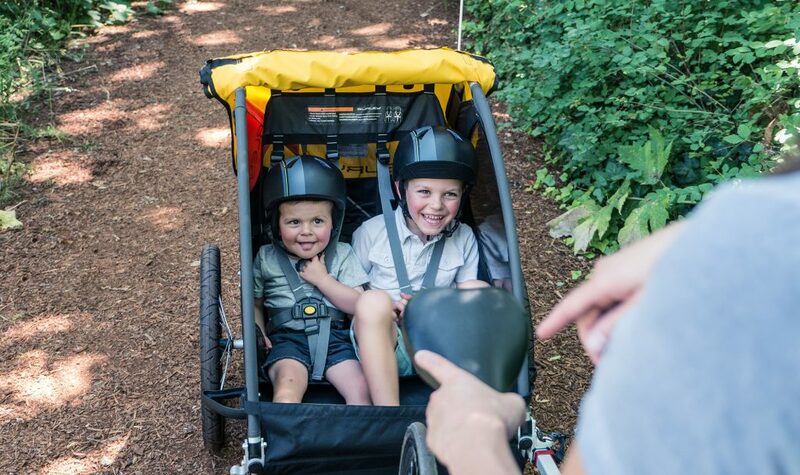 A double bike trailer is often the easiest, most cost effective way to carry multiple children by bike. (That said, it’s certainly not the only way to carry multiple kiddos by bicycle. Keep reading for some other options later on). There also happen to be a TON of double trailers on the market which can make things a little confusing. 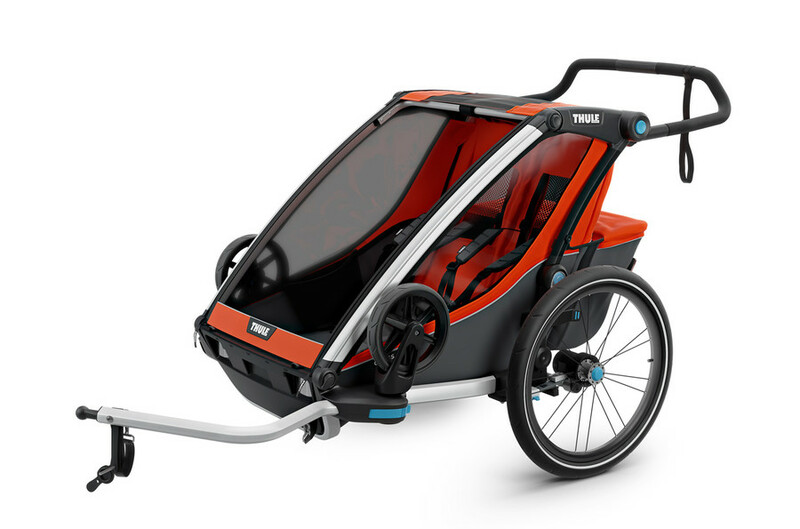 Start digging a little deeper and you’ll find that there a bunch of different features you can choose from including suspension and convertible trailers that convert to a stroller or jogger. If that all feels a little overwhelming, we’ve tested and researched dozens of trailers for you and narrowed them down to what we consider the 5 Best Double Bike Trailers. We’ve also added in some honorable mentions that didn’t make our top spots but that are high-quality and that might be a little gentler on the wallet. 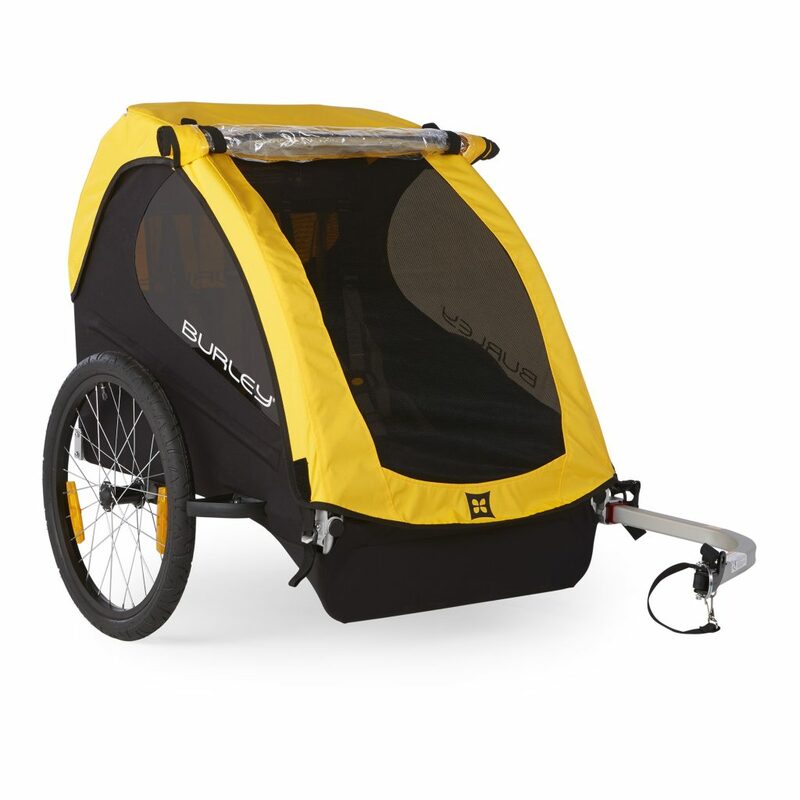 The Thule Chariot is like the Mercedes-Benz of bike trailers. It’s the favorite of nearly every super-active family I know, including my own. The Cross is the highest-end version and includes suspension, convertible kits for jogging and skiing, and works in all weather conditions. 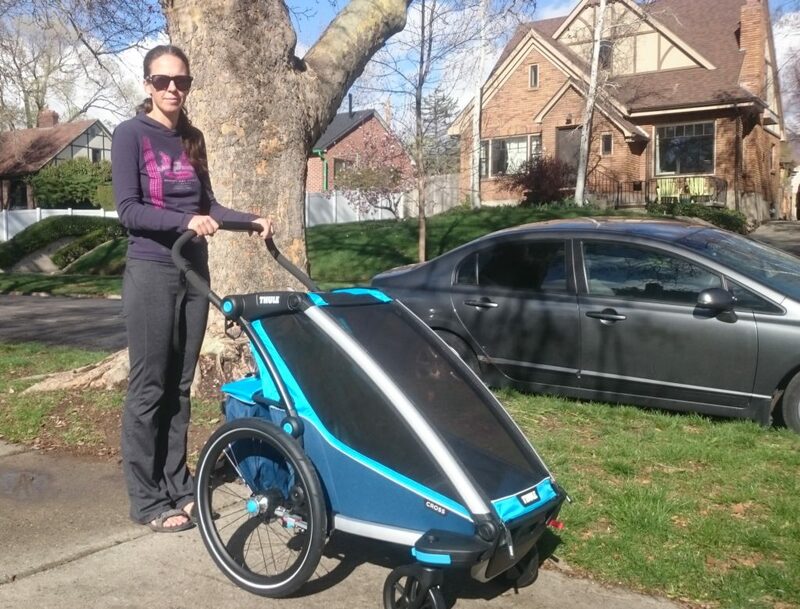 For more information, read my review of the Thule Chariot Cross bike trailer. As a parent, you know that everything that kids come in contact with get abused. That’s why we like the Burley Cub–it’s tough. Let kids jump in the double-walled reinforced bottom, crawl over the aluminum frame, and spill juice on the water-resistant material. Everything will be okay. 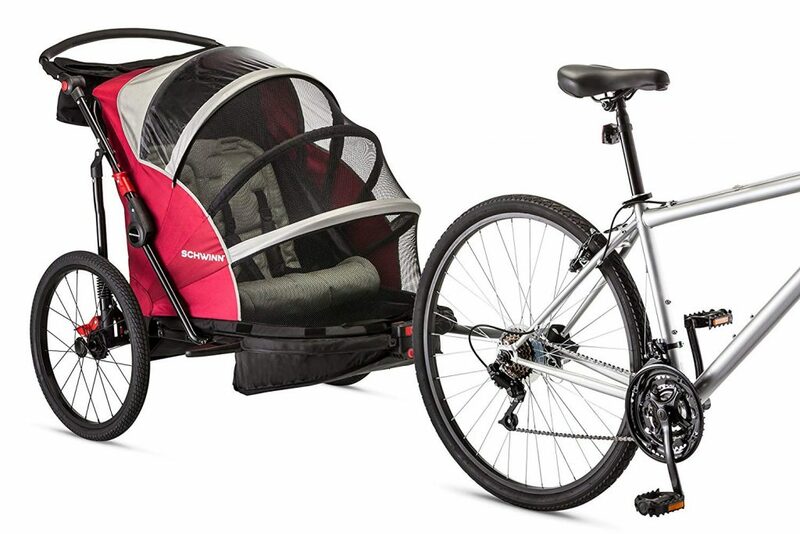 Like the Thule Chariot, the Burley Cub has suspension and convertible kits. For more information, read our review of the Burley Cub. 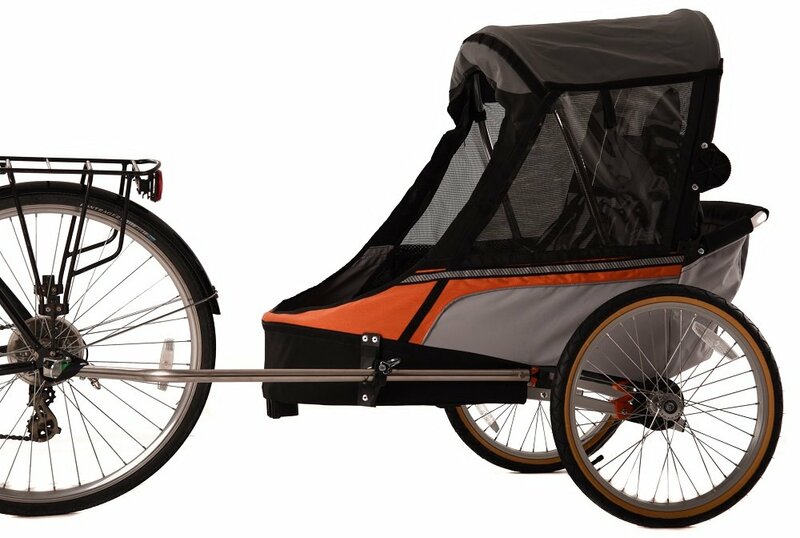 The Hamax Outback is comparable to both the Thule Chariot Cross and the Burley Cub but is a bit more affordable, making it a best buy in our book. We also like that the Outback is a little roomier than many other trailers and can even fit my 6-year-old. There’s also plentiful storage in the Hamax Outback which makes it nice if you need to carry a diaper bag, groceries, a picnic, or whatever. For more information, read our review of the Hamax Outback. Croozer isn’t as well known in the U.S. as other trailers on this list, but is just as high-quality. The Kid Plus 2 is their premium double trailer offering, and has all the bells and whistles you would expect from a premium trailer including suspension, conversion kits, 5-point harnesses, and a large rear trunk. As of January 2019, the U.S. distributor is getting rid of their stock so this is a great opportunity to get a high-quality trailer at a budget price. Here’s a trailer that doesn’t look like all the other trailers. In addition to it’s chic urban design, the Wike has unique features like side windows that are removable for sunny days, ultra-roomy interior, and super-compact footprint when folded. Listed above are what we consider “the best” double bike trailers. That said, not everybody needs “the best.” Maybe you just need a trailer to ride to the playground every once in a while and you don’t want or need all the bells and whistles. That’s fine too. Here are some trailers that aren’t our FAVORITES, but that are good quality and should be on your radar. We’ve tried to include some double trailers across the budget spectrum. 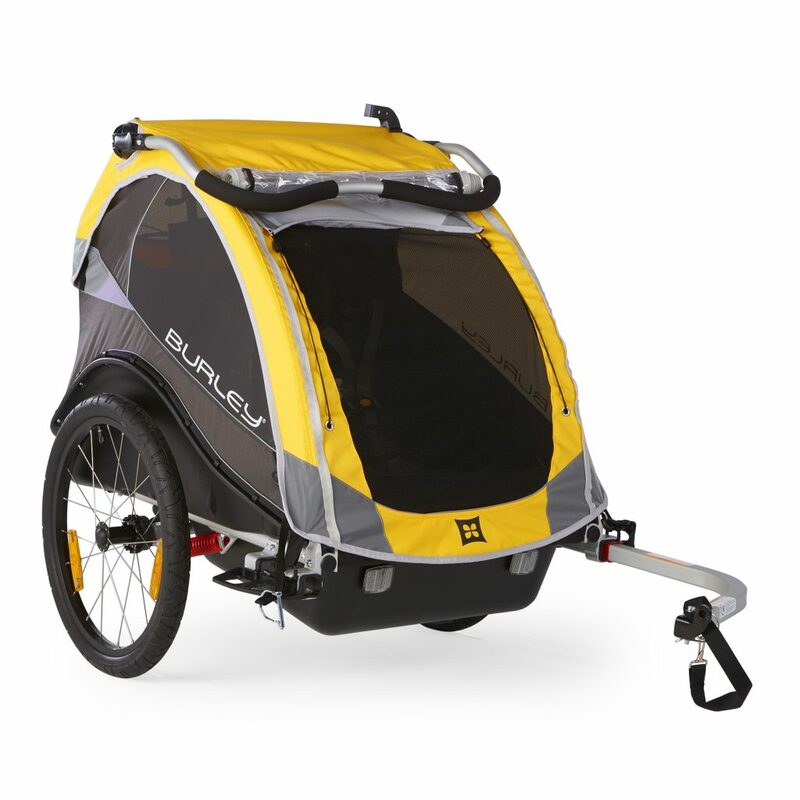 The Burley Bee is one of the best-selling bike trailers around and for good reason. It has everything you need and nothing you don’t. It’s simple, straightforward, and durable. For a bike-only trailer, this is our top pick. The price is right and nothing has been sacrificed in terms of safety or quality. The Coaster is the no-frills sibling of the Thule Chariot. It does convert to a stroller but lacks the additional conversion kits of the Chariot. That said, it has the same durable aluminum roll-cage, all-weather capability, and 5-point harnesses. If you just want a high-quality bike trailer, the Coaster is it. The best thing about the Allen trailer is how lightweight it is. At only 27 pounds, it is lighter than many trailers on this list, and still manages to haul 100 pounds worth of kids. This is the cheapest trailer on our list and is one of few “budget” trailers that offers 20″ tires on real wheels). We think that the Schwinn Joyrider has one of the coolest and most usable designs around. 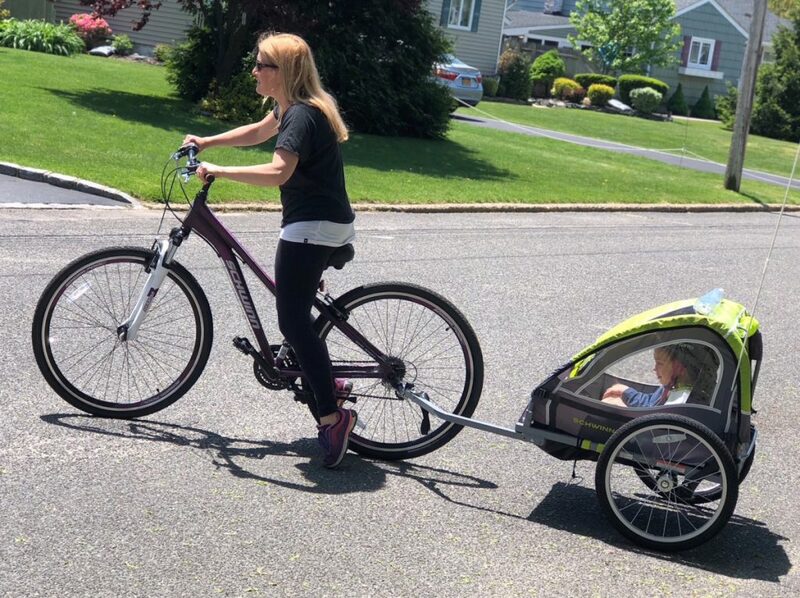 The trailer converts to a stroller quickly and easily which means you can bike to the farmer’s market and then push the kids around once you get there. We like that the canopy simply closes rather than needing to be zipped or velcroed which in our experience saves a lot of time when you are constantly opening it to help kids. 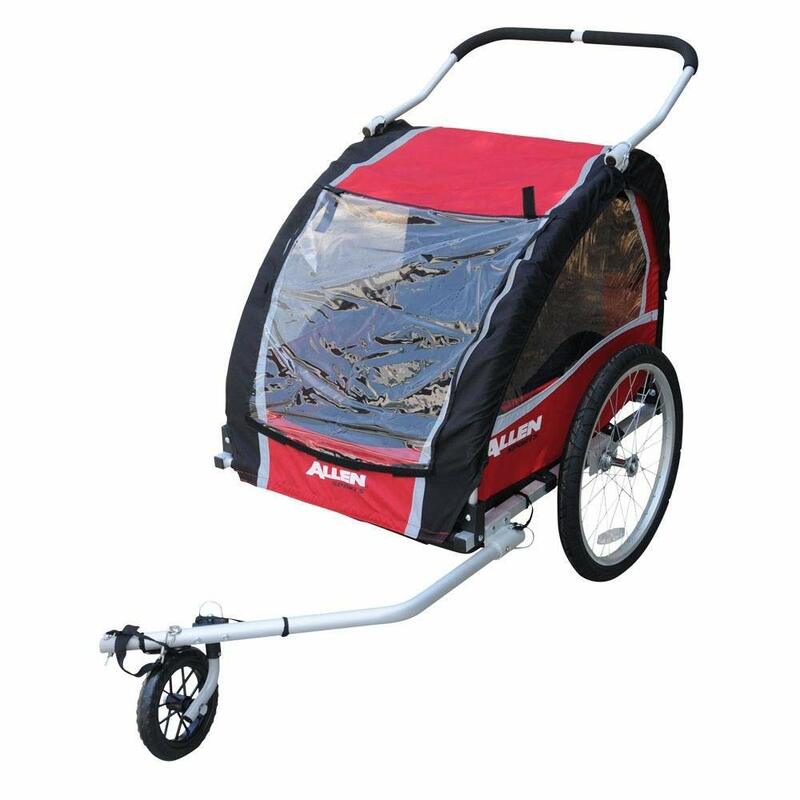 Before buying a double bike trailer, make sure that a bike trailer is really your best option. Many parents just assume that their ONLY option is a bike trailer. That’s not true. 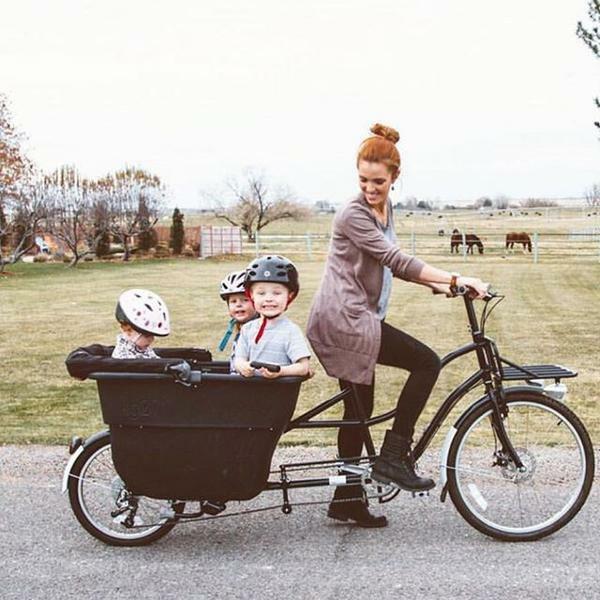 Other options for parents wanting to haul multiple kids is a cargo bike (this is often the BEST option though not the most inexpensive option), a double trailer-cycle like the Weehoo, or some combination of solutions such as a single trailer-cycle and a front-mounted bike seat. There are 8 things to consider when choosing a bicycle trailer for hauling kids. 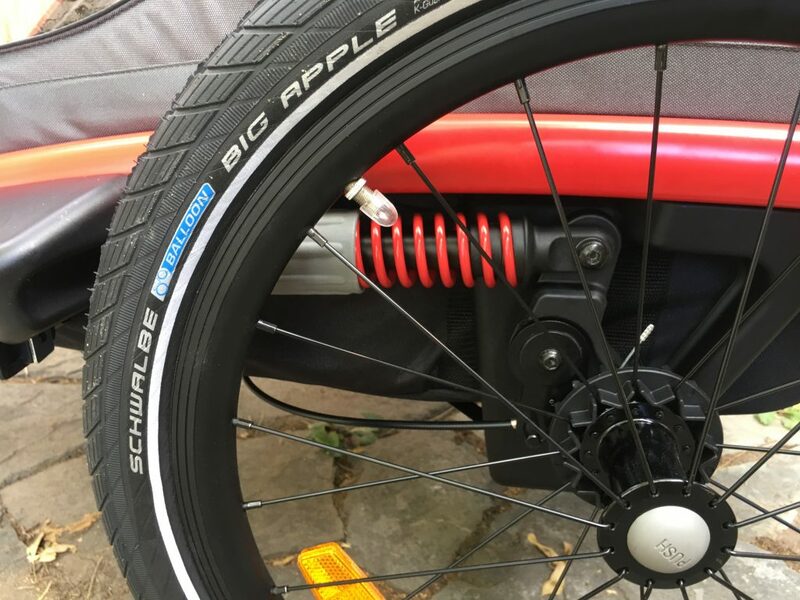 I’ll go into them briefly here, but if you want even more information before buying, read our article on how to choose a bicycle trailer as well. Since you’re reading this article, I’ll assume you’ve already narrowed this down and know that you need a double trailer. Do you want a trailer that acts solely as a bicycle trailer or one that can be used as a stroller, bicycle jogger, or even as a cross-country ski (or fat-bike) trailer? The cheapest and most straightforward option is to choose a trailer that is a bike trailer and nothing else. That said, if you think you might use it for any other sports, it can often be much cheaper to buy a convertible trailer, and it opens up a lot of options for outdoor recreation. You can expect to spend anywhere from $100 to $1,000 for a bike trailer. That’s a mind-boggling range, I know. At the low-end of the budget spectrum, trailers lack any extras. 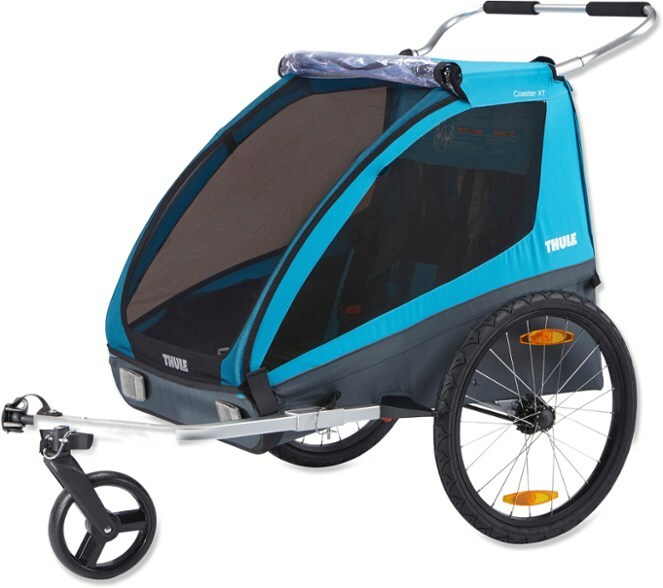 Expect to find a basic bicycle trailer without suspension, that might be a little heavy, and might not last more than a year or two. For many families, this is okay. At the high-end of the spectrum, you’ll find many of the trailers on our “Top 5” list. 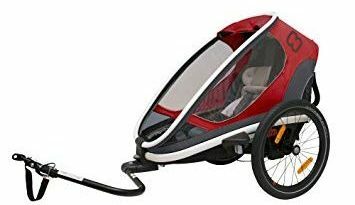 These have suspension, work in all weather-conditions, are durable and last for years, and convert to joggers/strollers/etc. If you’re a family that bikes a lot, or simply likes buying high-quality products that will last forever, opt for a higher-end trailer. Most families will fall somewhere in between. For a good-quality trailer that doesn’t have a ton of extras but will last for years, expect to spend around $250-$400. One of the biggest budget differentiaters is suspension. Add it, and things start to get pricey quick. That makes it one of the easier things to cross of the list if you’re on a tight budget. That said, if you can manage the extra cash, suspension does make for a more comfortable ride for your kiddos, especially if you are riding on rail trails or dirt roads. Even just riding around town, you’ll discover there are lots of curbs, potholes, and uneven roads that make having suspension nice. Almost no parent manages to go anywhere without lots of stuff. There are always spare clothes, diapers, snacks, and toys to haul along. That’s why we like paying attention to storage space when picking a trailer. 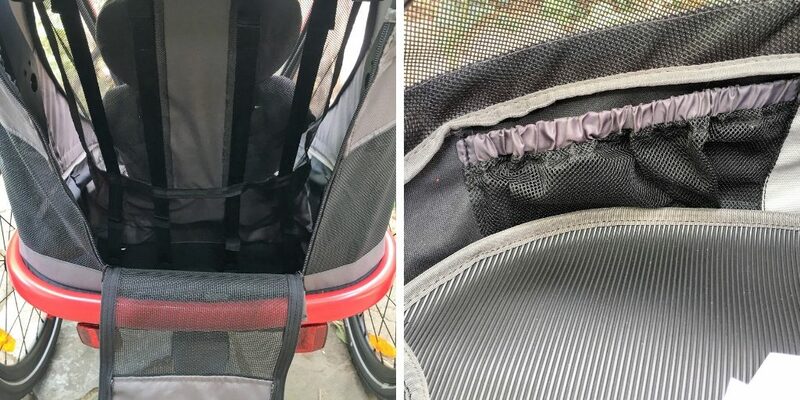 It’s also good to have a mix of exterior or trunk storage for things like library books and jackets, and some interior storage for water bottles, pacifiers, and small toys. If you plan on doing lots of bike riding, you’ll want a trailer than can handle lots of different weather conditions. We like having a trailer that can manage rain and snow, as well as one that has plenty of ventilation and protection from the sun on hot days. Pulling two kids plus their stuff is a lot of work. It becomes even more work if the trailer itself is heavy. I’d reccomend every parent take a look at the weight of the different trailers they are considering before buying. 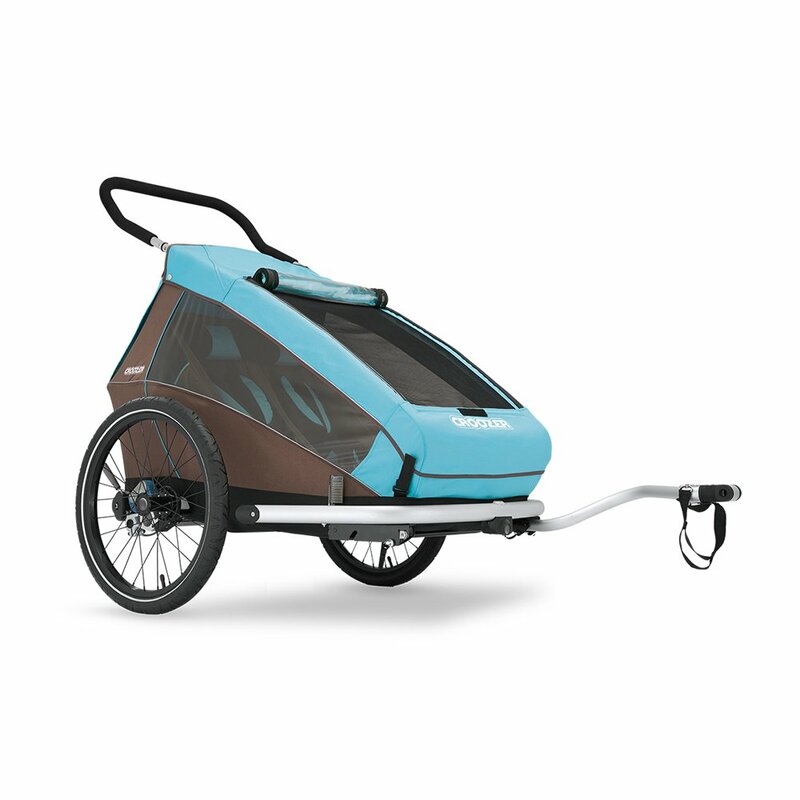 If you are planning on biking with a baby, choose a trailer that offers infant inserts as an option. Thule and Burley are probably the two best known trailer manufacturers for this. For other options, read our article on biking with a baby. Know that you know a little bit more about what to look for when choosing a bike trailer, use this comparison chart to narrow down your options.